Like most national state parks, hiking with dogs in the Smoky Mountains is prohibited. It may seem harsh, but there are good reasons for this. Dogs can carry disease into the park’s wildlife populations and may become prey to predators, such as black bears and coyotes. Dogs are allowed in the campground areas, picnic areas and along the road. The good news is that there are two footpaths within the park limits for hiking with dogs in the Smoky Mountains: the Gatlinburg Trail and the Oconaluftee River Trail. The Gatlinburg Trail is a three mile one-way path that leads from the Sugar Lands Visitor Center to the outside boundaries of Gatlinburg. It is a relatively flat trail that runs throughout the forest along the Little Pigeon River. Dogs must be leashed and bicycles are also permitted on this trail. 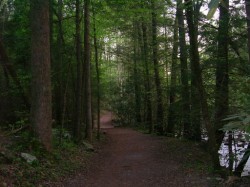 The Oconaluftee River Trail starts behind the Oconaluftee Visitor Center. Visitors can reach the trailhead by heading toward the Mountain Farm Museum. This three-mile trail has an elevation gain of 70 feet and is easy to walk. Following along the Oconaluftee River, the path is scenic with natural flora and fauna of the area. During the fall, the asters are absolutely beautiful. During the spring, the more than 40 species of wildflowers are in bloom. As the trail winds around the river, stonecrop, trillium, violets, Jack-in-the pulpit and squirrel corn dot the edges of the river. The trail also features flowering dogwood, tulip trees, eastern sycamore, white basswood and yellow buckeye. Dogs must remain leashed and bicycles are allowed on this trail. Check out our Gatlinburg Travel Guide for places to stay as well as hiking trails. Even though these trails aren’t many miles long, small pets may get tired along the way. Having a handy pet carrier can help ease those tired paws. Traveling Pet Supplies makes a pet carrier that accommodates pets up to 20 pounds. Its comfortable shoulder strap easily slips on and off, just like a handbag. Pets will feel secure, cozy and happy in this pet carrier, while you’re trekking the trails. This attractive pet carrier is available in a variety of trendy colors, including black and blue also at Traveling Pet Supplies. Although hiking with dogs in the Smoky Mountains is prohibited, the Gatlinburg Trail and the Oconaluftee River Trail will give canines a taste of the mountain experience. If you are traveling from out of town and need a pet friendly hotel, there are plenty in Gatlinburg. Make sure to check out our many options with special rates and often featuring added benefits for pet owners. Remember, booking early is essential when traveling with pets. See what’s available today so you get the best deals. Start your search for pet friendly hotels in Gaitlinburg here. Then sit back and think of all the fun things you can do when you get there!